Last Week in Review: The housing market continues to show signs of improvement, while consumers end 2013 with higher confidence. Forecast for the Week: Job market data will be prevalent this week. Plus, the minutes from the December meeting of the Federal Open Market Committee will be released. View: Check out this easy tip for managing anxiety during public speaking. Time will tell. As 2014 marches along, time will tell us what impact the Fed's tapering of its Bond purchase program will have on home loan rates. Remember that the Fed had been purchasing $85 billion in Bonds and Treasuries each month to stimulate the economy and housing market. Starting this month, the Fed will now purchase $40 billion in Treasuries and $35 billion in Mortgage Bonds (the type of Bonds on which home loan rates are based). The decision to further taper these purchases will be dependent on economic data.Speaking of economic data, Consumer Confidence rose to 78.1 in December, rebounding from the lows hit in October and early November due to the government shutdown. In housing news, the S&P/Case Shiller Home Price 20-City Index rose by 13.6 percent year-over-year in October. This was just below expectations, but up from the 13.2 percent annual gain recorded in September. Pending Home Sales for November ticked up slightly, while New Home Sales fell slightly to an annual rate of 464,000 units. However, the number of New Home Sales for October was revised up to 474,000, which was the highest level since July 2008. Overall, the housing market continues to improve. What does this mean for home loan rates? The Fed will be closely monitoring economic reports in the coming weeks and months as it decides when to further taper its Bond purchases. The timing of further tapering could have a big impact on Mortgage Bonds and home loan rates this year. This is a key story to watch in 2014. Job market data will be front and center during the first full week of January. The week kicks off with the ISM Services Index on Monday. Wednesday will bring the first leg of the week's jobs data with the ADP National Employment Report. As usual, Thursday brings Weekly Initial Jobless Claims, which have been jumping around due to the holiday seasonal job market. In addition, the minutes from the Fed's December meeting of the Federal Open Market Committee will be released Wednesday and these always have the potential to move the markets. 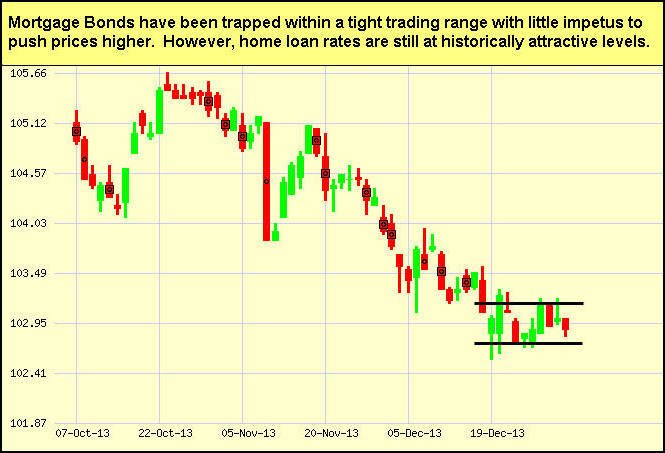 As you can see in the chart below, Mortgage Bonds have been caught in a tight trading range. Home loan rates remain attractive compared to historical levels and I'll be monitoring them closely. Anxiety Management for Public SpeakersSpeaking with clients, referral partners, or prospects one-to-one is a skill most people in business have already mastered. But when it comes to public speaking, confidence is not as easy to come by.And it's easy to be a little envious of those who have the ability, since the benefits of being able to deliver a message one-to-many are numerous: overcoming fear, boosting self-esteem, honing critical-thinking and analysis skills, improving communication and networking opportunities, expanding your personal brand, getting more business, and impressing your audience... and your boss, if you have one.You may not be more afraid of public speaking than death but that doesn't mean you won't get a serious case of the jitters. The standard prescription used is to find ways to force yourself to relax and calm down before giving your presentation. Except, this isn't the most effective way to channel that nervous energy.New Harvard Business School research shows getting excited reduces performance anxiety better than trying to calm down. "Anxiety is incredibly pervasive," says Alison Wood Brooks, PhD., author of the study. "People have a very strong intuition that trying to calm down is the best way to cope with their anxiety, but that can be very difficult and ineffective. When people feel anxious and try to calm down, they are thinking about all the things that could go badly. When they are excited, they are thinking about how things could go well." Because both anxiety and excitement are highly charged emotional states, it's easier to convince yourself that your anxiety is actually excitement, rather than try to convince yourself you're not anxious at all. Brooks says, "When you feel anxious, you're ruminating too much and focusing on potential threats. In those circumstances, people should try to focus on the potential opportunities. It really does pay to be positive, and people should say they are excited...even if they don't believe it at first." So, what's the best strategy? Dr. Brooks recommends that prior to any presentation you should tell yourself you're excited and forget about trying to calm down. In fact, simply saying "I'm excited!" out loud will naturally increase your feelings of excitement and get you pumped about the rewards of public speaking that are about to be yours! Give this helpful tip a try on your next public talk, and feel free to pass these tips along to your team, clients, and colleagues.